Our Hypnotherapy Training Courses and our CPD’s offer accredited educational training designed for student therapists and personal development consultants. While our courses major in hypnosis training, they also provide modules and qualifications in NLP training (Neuro-Linguistic Programming), CBT training through Cognitive Behavioural Psychology, RCP (Rapid Cognitive Processing – a blending of EMDR, NLP and CBT) and Emotional Freedom Therapy. Tag Academy’s Hypnotherapy Trainings begin with the completion of the three weekend (six days training) Foundation Diploma in Hypnotherapy which offers an introductory taster to the world of therapy allowing apprentice practitioners to work under supervision limited to seeing clients with non-complex issues. You can then progress to complete our Clinical Hypnotherapy Diploma during the following seven weekends (14 days training). You will find that our tutors are supportive and flexible, we are proud of the tactical training team at TAG, who take individual student requirements into account giving you the best possible experience when you train with us. All our hypnotherapy training courses are interlinked – ie the first three weekends of the Clinical Diploma incorporate all of the Foundation Diploma course and the first year of the Master course incorporates all of the Clinical Diploma. Thus there is a seamless transition through every one of our training programmes. Our 10 month Clinical Diploma Hypnosis Training Courses are for those serious about becoming therapists. The course is fully accredited, registered and recognised by the Department for Education through the NCFE, the Open University, Ministry of Defence and the major UK therapy governing bodies, The National Council for Hypnotherapy, The General Hypnotherapy Register and The National Institute of Cognitive Psychology. TAG Academy’s Hypnotherapy training courses across the South East of the UK, provide you with all the necessary qualifications and skills to be a competent Hypnotherapist. Our ten month, classroom based Clinician Course equips you with the ability to start running your own full time practice. You will also be able to obtain full insurance and membership to professional therapy bodies. What is important to you when looking for a hypnotherapy training course provider? • On-going support post-training to help to establish a thriving therapy business! 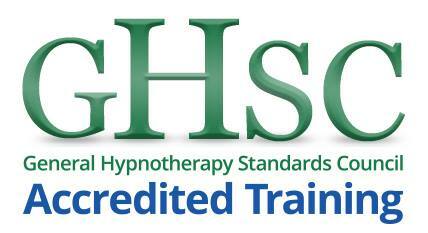 Our Hypnotherapy Practitioner Diploma is recognised by the Open University (OU). It provides the holder of this qualification with 45 academic credits from the OU at Undergraduate Level 1. Our Clinical Diploma in Hypnotherapy Practice has been assessed and validated at practitioner level by the General Hypnotherapy Standards Council (UK). Graduates from our course are eligible for professional registration with the General Hypnotherapy Register, at full Practitioner status, together with the acquisition of the industry-based award – the General Qualification in Hypnotherapy Practice (GQHP). Upon completion of your Hypnotherapy Practice Diploma, you will be awarded a certificate of achievement by NCFE. The HPD has been accredited by the NCFE as having measurable learning outcomes that have been benchmarked at Level 4 (using Ofqual’s Qualification and Credit Framework (QCF) level descriptors). The National Council For Hypnotherapy has been approved as an NCFE centre and the HPD has been accredited by the NCFE to guarantee that it is of a high standard and meets the rigorous requirements of a national awarding organisation. NCFE accreditation gives assurance that the content of a training course is of a high standard and meets the rigorous requirements of a national awarding organisation. Graduates of our NVQ Level 4 HPD Clinician course will be eligible to register with the Complementary & Natural Healthcare Council (CNHC). TAG’s 2 year Master Practitioner Hypnotherapy Training Course, which includes advanced NLP, CBT and RCP, adds new levels of skill and competency and can be undertaken afresh by those wishing to start out as therapy practitioners. Alternatively they are a wonderful opportunity for existing hypnotherapists with proven recognised qualifications to increase their skill base. Established practitioners are exempt from the first year of the Master course and can commence at Year 2 level. If you are an existing therapist, please contact us to establish the potential of Year 1 exemption.